The month view allows you to see a greater range of your plans at once. 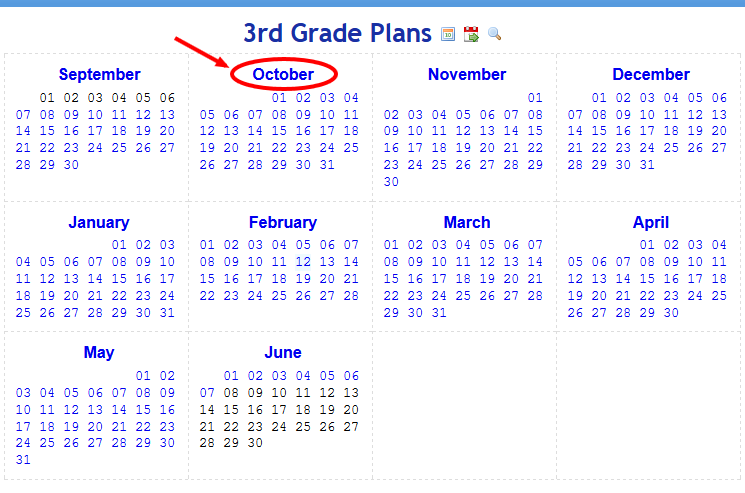 You can filter the plans to show only certain periods, making long term planning easier. All the features from the weekly and daily view are available, so you can move plans anywhere and access your Cubby as well. By default all the periods are shown. You can hide or show periods by unchecking and checking the boxes as needed. For example, if you only want to view period 4, uncheck the "All" box to hide all periods, then check the box for period 4 to show just that one. To view and edit the plans in the month view, click the magnifier icon on the left of the row. This will expand all the plans for that period. This will expand that row so that you can edit the plans, as well as see the attachments and standards. You can also expand an entire week at once by clicking the magnifier icon in the title row.